Remler was based in San Francisco, not far from here. This attractive little cathedral (one of the smallest you'll find) houses a four-tube TRF two-band receiver. The main broadcast band covers 540-1500 kHz, and the "Police" band covers 1500-4000 kHz. The radio has had a full electrical restoration, with new capacitors, strong tubes, new resistors where needed, and a new vintage-style power cord. Since TRF sets are generally less sensitive than superhets, the careful alignment I've done on this one really pays off in terms of squeezing about as much sensitivity out of just four tubes as you can get. 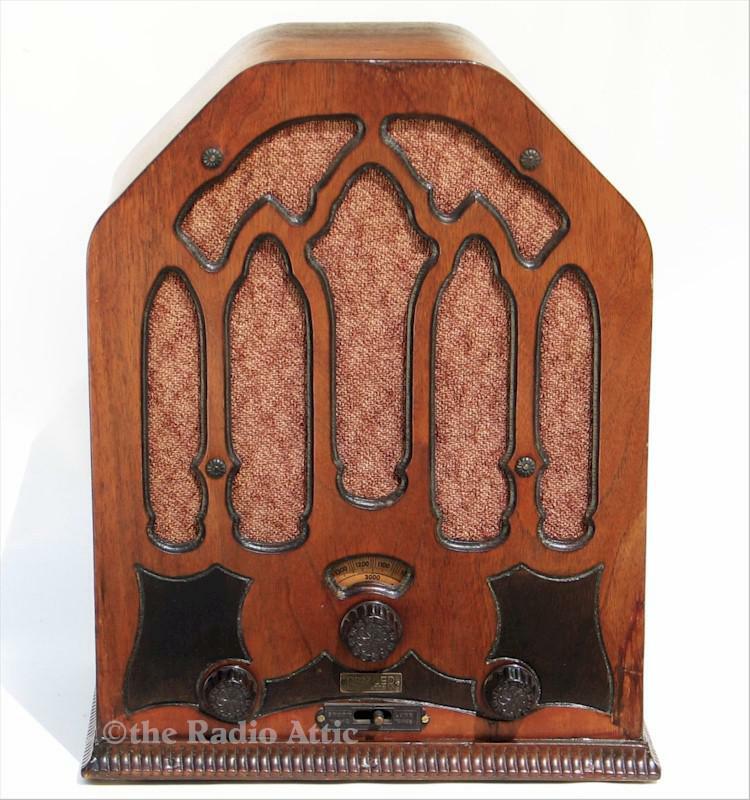 Long ago (probably in the 1940s) this radio was converted from 2.5 volt to 6 volt tubes. This has no effect on either appearance or performance (the tubes have the same size and shape), and is an interesting part of the history of this set. The original 8-inch speaker is in fine shape and puts out good sound. The right knob on the front panel is a tone control. The walnut veneered cabinet was refinished by a prior owner, and there has been very little scratching or other damage since then, so it still looks good. Lighted dial. 13"H x 10-1/2"W x 7-1/4"D.